Airshear technology has been repeatedly proven to be the most effective way of applying male pollen to female kiwifruit flowers. 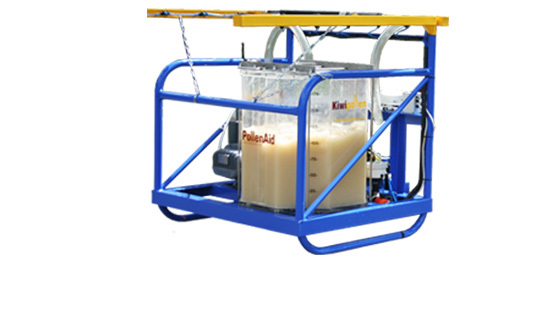 Kiwi Pollen has developed a Kiwi Pollen Sprayer that is portable, lightweight and simple to use. The sprayer uses airshear technology and is suitable for both large and small orchards. The Kiwi Pollen Sprayer mixes low pressure air with the pollen suspension within the airshear nozzle to create uniform droplet sizes. The spray angle from the nozzle facilitates accurate and efficient delivery of the pollen to the target flower. Pollinating flowers by spraying pollen with PollenAid® is a commercial success story. The PollenAid® process maintains the viability of kiwifruit pollen in a water-based suspension so it can be sprayed on to female flowers to set seeds. The more seeds that set, the bigger the fruit will be. By using PollenAid®, flowers can be pollinated during adverse weather, when insect and wind pollination is not possible. The wet spray system has many successes even in heavy rain. The 4L Pressure Sprayer has a robust backpack which can be pressurised to last for an entire tank without re-pressurising. It's mounted on your back and has a supply tube leading to a hand piece. It’s easy to use when targeting each flower or group of flowers for assured pollination. A Tractor-Mounted Airshear Sprayer is available with sufficient capacity to operate up to eight Airshear nozzles at once. The Tractor-Mounted Airshear Sprayer is ideal for pollinating T-bar and pergola orchards with teams of sprayer operators. Mounted on the three-point linkage, with a 15 litre tank for pollen. Driven from the PTO, resulting in efficient use of pollen with Airshear nozzles. Includes a 12 volt mixer-agitator to initially mix the pollen into the PollenAid® solution and keep it in suspension. has airshear nozzles which produce a fine mist of pollen spray application rate: 750 grams per hectare, 1.5 hours per hectare can cover large areas and at 750 grams per ha is best suited to use in addition to bees. Can be used for full pollination at higher rates of pollen.